Papillary carcinoma (most common type)—It usually grows very slowly and often spreads to lymph nodes in the neck. If caught early, this type of thyroid cancer is often curable. Follicular carcinoma (second most common type)—It usually stays in the thyroid gland, but can spread to other parts of the body, such as the lungs and bones. It does not usually spread to the lymph nodes. If caught early, this type of thyroid cancer is often curable. Anaplastic carcinoma (rare form of thyroid cancer)—It quickly invades the neck and other parts of the body and is often fatal. Thyroid lymphoma (rare type of thyroid cancer)—Many cases occur in people who have a disease called Hashimoto thyroiditis . The doctor will ask about your symptoms and medical history. A physical exam will also be done. This may include a careful examination of your neck to look for lumps or abnormalities. 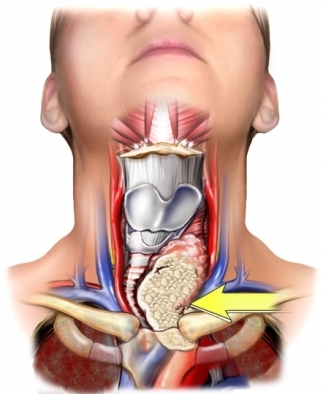 Thyroidectomy —Removal of all or part of the thyroid gland. Radioactive iodine therapy —Large doses of radioactive iodine are used to destroy the thyroid gland and thyroid cancer without affecting the rest of the body. External radiation therapy —To kill cancer cells and shrink tumors. Radiation is directed at the tumor from a source outside the body. If you have been exposed to radiation of the head, neck, or chest, have frequent checks for thyroid cancer. General information about thyroid cancer. National Cancer Institute website. Available at: https://www.cancer.gov/types/thyroid/patient/thyroid-treatment-pdq#link/%5F1. Updated August 18, 2017. Accessed October 6, 2017. Papillary thyroid cancer. EBSCO DynaMed Plus website. Available at: http://www.dynamed.com/topics/dmp~AN~T115275/Papillary-thyroid-cancer . Updated July 24, 2017. Accessed October 6, 2017. Thyroid cancer. American Cancer Society website. Available at: https://www.cancer.org/cancer/thyroid-cancer.html. Accessed October 6, 2017. 4/7/2014 DynaMed Plus Systematic Literature Surveillance http://www.dynamed.com/topics/dmp~AN~T116280/Acromegaly : Wolinski K, Czarnywojtek A, Ruchala M. Risk of thyroid nodular disease and thyroid cancer in patients with acromegay—meta-analysis and systemic review. PLoS One. 2014;9(2):e88787. 7/7/2014 DynaMed Plus Systematic Literature Surveillance http://www.dynamed.com/topics/dmp~AN~T116074/Sjogren-syndrome : Liang Y, Yang Z, Qin B, Zhong R. Primary Sjogren's syndrome and malignancy risk: a systematic review and meta-analysis. Ann Rheum Dis. 2014;73(6):1151-1156. 10/1/2014 DynaMed Plus Systematic Literature Surveillance. http://www.dynamed.com/topics/dmp~AN~T576498/Complications-of-obesity : Bhaskaran K, Douglas I, Forbes H, et al. Body-mass index and risk of 22 specific cancers: a population-based cohort study of 5.24 million UK adults. Lancet. 2014;384(9945):755-765.